Be the first to receive discounts to endurance races near you. 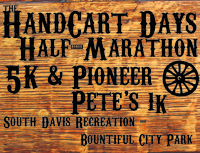 Join the South Davis Recreation Center, Bountiful Handcart Days & The Bountiful Exchange Club for our annual Handcart Days Half Marathon, 5k & 1k. This event is a hoot and a holler! Bring the whole family, pick an event (half marathon, 5k or 1k), and run with Pioneer Pete! Afterwards all registered participants can receive a free breakfast courtesy of the Bountiful Exchange Club. Then head to the park for fun and games! Celebrate Bountiful's heritage! Make this a yearly tradition for you and yours! Saturday, July 22nd 5:00am - 6:30 am. Early start @ 5:30am. Designed for the slower runner (14 min/mile +) Not eligible for awards. 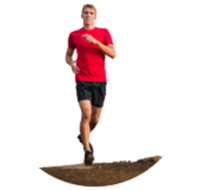 Check out our website for more race details and information! Receive exclusive RACEPLACE discounts for your favorite events. © RACEPLACE, Inc. All Rights Reserved.